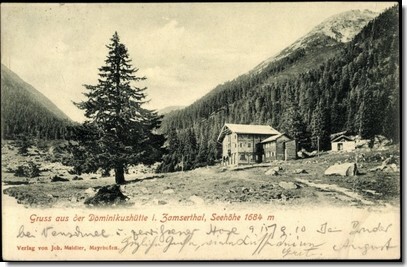 The in the Zammser-Grund situated hut was build in 1883 by the section Prague of the German-Austrian Alps Association. The member, Hermann Dominikus, a bookseller from profession, donated the hut to his section and gave his name to the hut. 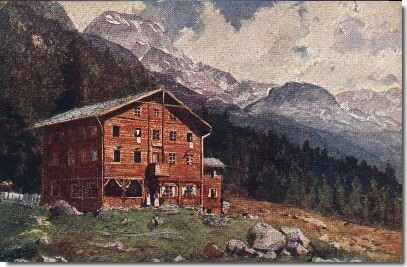 After the founder passed away, the Eder family from the Breitlahner hostelry bought the hut. 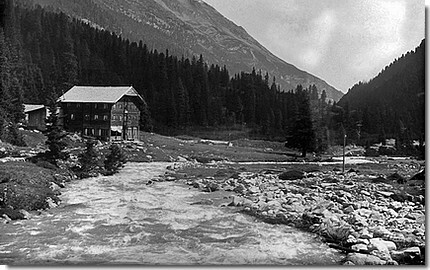 In 1890 the hut was purchased and exploited by the famous mountain guide Hans Hörhager until the end of the 1st World War in the year 1918. In the same year the hut burnt down completely due to unknown reasons. 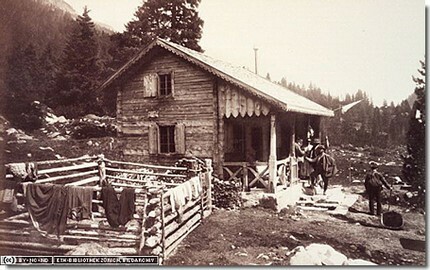 Shorltly after Hörhager had the hut rebuilded and it was thereafter exploited by his daughter Lisl. The complete Zamsergrund once belonged to the Pfitsch community - nowadays mainly the Schlegeis reservoir is situated here. 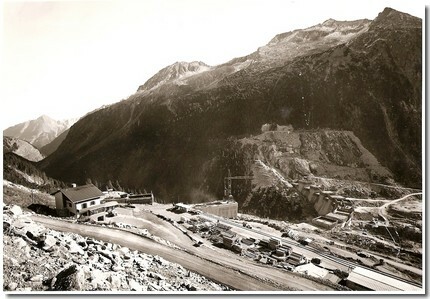 The contemporary Dominikushütte is newly build because the original hut is now on the bottom of the reservoir. 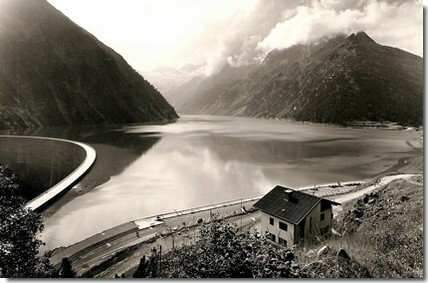 It was not before the year 1919 that the border of Italy and Austria was definitely drawn at the Pfitscher Joch. The alms in this region however, still belong mostly to Italian owners. Until the early 1990s tax collectors were active at the border station on the Pfitscher Joch and still conducted pass inspections. Until the end of the 1st World War the border between the districts of Sterzing and Schwaz was situated about half an hour walk above the Breitlahner hostelry. At the end of the 1st World War this border also became the stateborder between Italy and Austria. 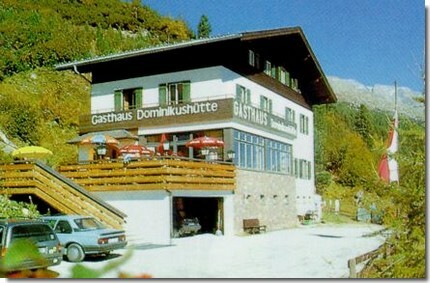 The Dominikushütte found itself suddenly on Italian territory and the owners needed a passport to reach the hut. Only after the final border was drawn the Dominikushütte once again belonged to Austrian territory. 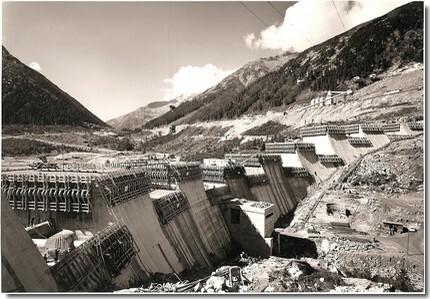 At the end of the 1960s the Tauernkraftwerke AG started building the dam of the Schlegeis-reservoir. The old hut had to be offered to the new reservoir. At 15.07.1970 the Zamsergrund was partly closed. The final closure was completed in 1973. As a replacement the Tauernkraftwerke builded a substantial larger hut. The name Dominikushütte was maintained. The Dominikushütte is situated on the south-east slope of the Olperer on a beautiful spot directly adjacent to the reservoir. A tollroad leads you from Ginzling directly to the hut. This street was also build by the Tauernkraftwerken as it was necessary for the construction of the reservoir and is now called the "Alpenstraße Schlegeis".